Updated 25th September. Most of what I said below has proved to be wrong. July 14th: Tarbes – La Pierre-Saint-Martin. July 15th: Pau – Cauterets or somewhere nearby. July 16th: Lannemezan – Foix or somewhere nearby. The basic outline of the 2015 Tour de France is now well known. The route will be announced in Paris on 22nd of October. While the route of week one looks pretty conclusive, the following two weeks through the Pyrenees and Alps not so much, especially the Pyrenees. So what do I know about the Pyrenees and what is my best guess. For certain there will be a transfer from Brittany to Pau on 12th July. Rest day in Pau on Monday 13th July. A mountain stage in the Pyrenees on 14th July. Bastille Day is a public holiday in France and the TV audience will be one of the largest of the Tour, an interesting route is needed. There are some weak rumours that there will be a stage finish in Cauterets. This would almost certainly be at Cambasque which has hosted Le Tour and La Vuelta in the past. The last time for Le Tour de France was in 1995 with a stage from Saint-Girons won by Richard Virenque. It was in this stage that Fabio Casartelli lost his life. The original plan by ASO (Amaury Sports Organisation, who own Le Tour) was to finish at Pont d’Espagne. It would indeed be a very spectacular finish. Pont d’Espagne is in the National Park and in the end the conditions set by the Park were unmeetable by ASO and the stage finished at Cambasque. Possible route would be Col de Marie Blanque, Col d’Aubisque, Col de Borderes and Cambasque. Another possibility would be to use Col de Spandelles. I think this unlikely. The Spandelles was ruled out by ASO for this years tour as the road is very narrow. They did say that it may appear in the Vuelta in the near future and roads can be widened. It would be a very selective climb at 10.2km at 8.4%. In fact the Port de Balé was a dirt road 10 years ago. It was paved especially for Le Tour. It is also possible for a stage similar to the Pau – Hautacam stage this year, by climbing the eastern side of Col du Tourmalet and then up to the finish at Cambasque. Or for something completely different an ITT from Lourdes to Cauterets. All that is pure rumour and idle speculation. Pau – Col du Couraduque / Val d’Azun. A possible new stage finish in Val d’Azun. Col de Couraduque is one of my favourite climbs. Anyone who has cycled in this area will be familiar with the signs which count down the kms on the climbs. They are erected by Conseil General des Hautes Pyrenees on the main Tour de France climbs. The Col de Couraduque has not been in Le Tour. Yet it has the signs the same as those which have. Forward planning? François Fortassin is a Senator for Hautes Pyrénées. He is the man credited with the idea to pave Port de Balés for Le Tour de France. In an interview in July of this year he said that in the future he was hopeful that Col de Beyrède, Col de Portet and Col de Couraduque would feature. He also said that he has taken Tour de France director Christian Prudhomme to visit each location. Could 2015 be the year for Col de Couraduque. The Tour has a great record of including new climbs over the last 30 to 40 years. Same as last year or Marie Blanque, Col d’Aubisque and Hautacam. Same as some of the suggestions above. Marie Blanque, Aubisque, Borderes and Luz Ardiden. Or Col du Tourmalet and Luz Ardiden. 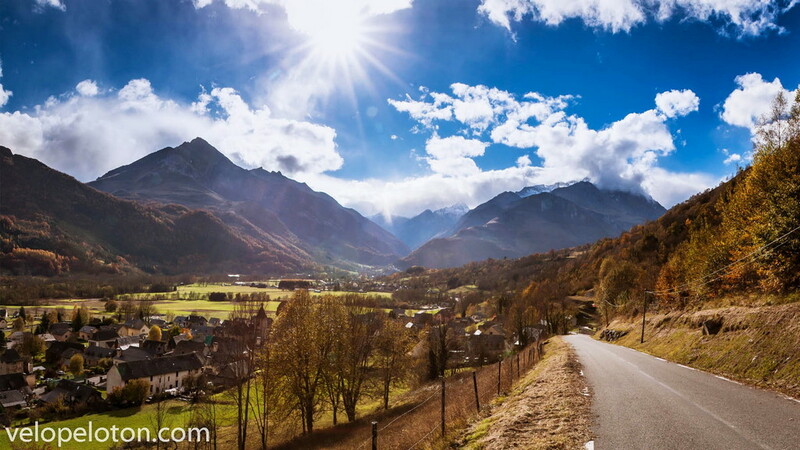 Pau – Col du Tourmalet. Same or similar to 2010. If I was route director. I would have an ITT from Saint-Savin to Col de Couraduque via Col des Borderes. Or an ITT from Lourdes to Col de Couraduque via Voie Verte des Gaves. Another day in the mountains. This stage will most probable be from Lourdes or there abouts, to Saint Girons. It will cross Col du Tourmalet, Col d’Aspin, Col de Peyresourde, Col de Menté and Col du Portet d’Aspet and will be in honour of Fabio Casartelli who died in a crash on Col de Portet d’Aspet in 1995. Stage 12 will leave the region. Possible route will be from Muret, north to Rodez.